Although it’s a special cut, the inherent tenderness of Tenderloin means it’s a very easy cut to handle. Tweak our recipe as you see fit. The key is to keep it medium rare, which means less time and lower heat than most recipes (which are designed for conventional, corn-fed beef tenderloin). 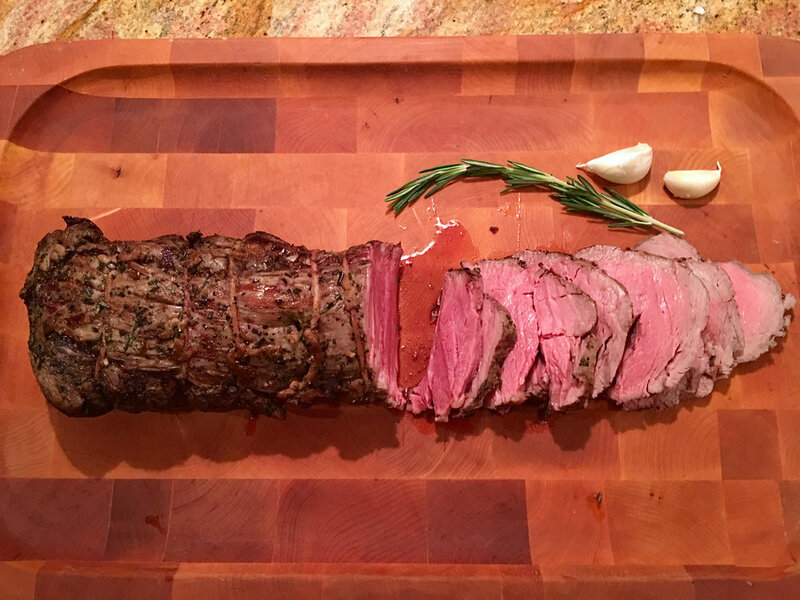 -Bring whole Tenderloin to room temperature (2-3 hours) before cooking. -Sear in a pan, on a grill, or at high heat in an oven to seal in juices. -Finish by cooking at reduced heat in the oven. -Let rest 10 minutes before serving. 1) Preheat oven to 425˚F. 2) With a sharp knife, trim tenderloin of silverskin and excess exterior fat. 3) Fold the tail end of the tenderloin under to make a tenderloin of uniform thickness. Bind with twine to keep everything in place (see photo). 4) Combine fresh herbs, olive oil (and garlic if desired) in a small bowl. Rub over the entire tenderloin. 5) Sprinkle all sides of tenderloin generously with salt and pepper. 6) Place tenderloin on a broiling pan in the oven and roast for 15 minutes, or until outside begins to brown. 7) Reduce oven heat to 300˚F and continue to cook. Check internal temperature with a quick-read thermometer after 30 minutes. For medium rare, remove when the thermometer reads 130˚F. 8) When tenderloin has reached your preferred doneness, remove from oven and let rest, tented under foil, for 10 minutes before slicing.